How Often Should You Eat Tomatoes? The United States produced more than 32 million pounds of tomatoes in 2009, according to the U.S. Department of Agriculture. Although the versatile tomato is horticulturally a fruit, most people use tomatoes as a vegetable in salads or Italian dishes. No matter how you classify the tomato, eating tomatoes on a regular basis offers you nutritional and health benefits. A cup of chopped or sliced tomatoes contains 32 calories, a cup of cherry tomatoes has 27 calories and a whole tomato has about 33 calories. 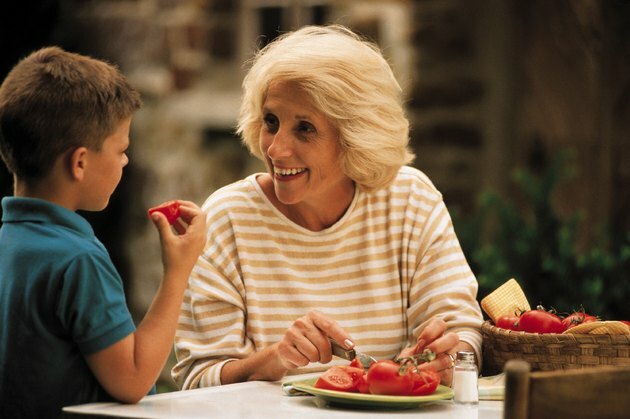 A serving of tomatoes has a trace of fat, about 2 g of fiber and 7 g of carbohydrates. Tomatoes have naturally occurring sugar and are a good source of vitamin C, folate, lycopene and vitamin A. Lycopene is the chemical that makes the tomato red, according to the National Institutes of Health. You need about 2,310 to 3,000 IU of vitamin A each day, and a cup of tomatoes provides between 41 to 53 percent of your daily recommended intake. The Dietary Guidelines for Americans suggests that a person eating a 2,000 calorie diet consume 2 1/2 cups of vegetables each day for optimal health. Of the 17 1/2 cups per week, you should eat about 5 1/2 cups of red and orange vegetables. Assuming you eat half in orange vegetables such as carrots, squash or sweet potatoes, you can eat about 2 1/4 cups of tomatoes each week. If you eat tomatoes three times a week, you can have 3/4 cup each time. If you eat tomatoes each day, you can have about 1/3 a cup each day. Eating tomatoes on a regular basis gives you vitamins and minerals in a low-calorie package. Eating low-calorie, filling foods such as tomatoes may help you manage your weight and avoid some of the adverse effects of obesity. Additionally, the American Cancer Society indicates that although no conclusive studies exist on tomatoes and their protective effect against some cancers, including tomatoes in your diet may be beneficial for your health. When you use tomatoes in your diet regularly, you fulfill part of your vegetable requirement. Tomatoes add flavor to salads and submarine sandwiches, and make up the basis of many Italian dishes. When using canned tomatoes, purchase low- or no-sodium products to avoid the 564 mg of sodium in a cup of stewed canned tomatoes. Many tomato soups are also high in sodium. You should only consume 2,300 mg of sodium a day. You can juice fresh tomatoes for a homemade tomato juice, add tomatoes to soup, make your own barbeque sauce with fresh tomatoes or use Roma tomatoes to make your own sun-dried tomatoes. Are Tomatoes High in Sugar?